If you love beading, then you are always looking for new ideas and inspiration. There are more projects to choose from than ever before and it's fun to explore all the possibilities. 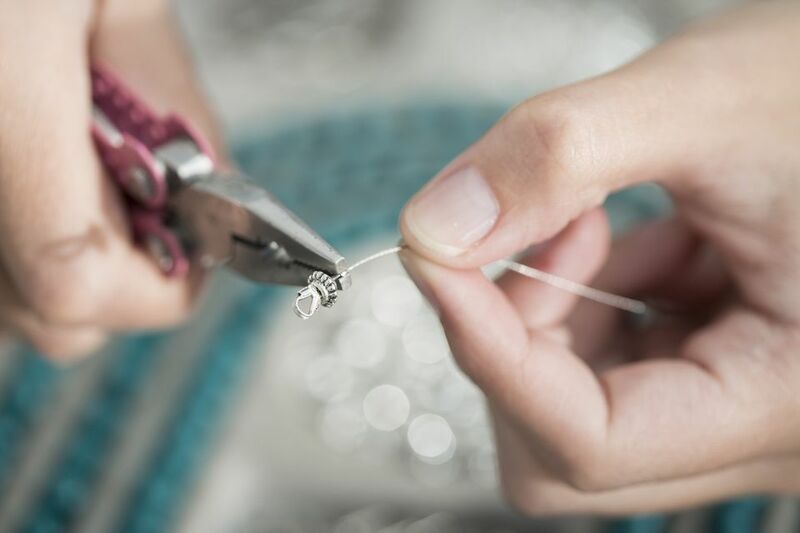 No matter what your experience in beading is, we have a few project ideas for you. All of the beading patterns are free and they come in a wide range of styles and techniques. Among the featured patterns, you'll find classic peyote stitch bracelets and rings, elegant pendants, and funky fringe earrings. They're fun and most are relatively easy, so let's get started. It's easy to create an elegant circle pendant with seed beads and this pattern is a lovely example. The finished necklace can work for casual or formal outfits and you'll enjoy just how simple it is to make. The Beaded Circle Necklace uses seed beads in the brick stitch, so you'll want to be familiar with working that stitch flat before beginning this project. Yet, if you have some practice with the brick stitch, this pendant works up quickly. Create a long necklace or shorten this pattern up for a bracelet if you like. Either way, it's one of the easiest wire-wrapped projects you can create. The design is simple and will work with a variety of beads. Just make sure you have enough coordinating beads for the entire project. The tutorial will walk you through the wire wrap using an assembly line approach, which speeds up the work considerably. All you need is three simple beads and the wire of your choice to make this brilliant pea pod pendant. It's a fantastic project for gifts and can be customized to the recipient. The design is both lovely and easy. A trio of beads is wrapped into a pea pod to create a long drop pendant in just a few quick steps. It's a project you'll come back to again and again and the design possibilities are endless. There are many great design ideas for beaded bracelets available and the hardest part may be deciding which to do first. One of our surprising favorites is the ladder stitch bracelet. This pattern goes back to the basics of beading and it's a bracelet that can easily be layered because it's a thin weave of seed beads. The design itself is simple and it can be dressed up with a delicate charm. Hand chains are a trend that comes and goes but there's always room for one in your jewelry box. This one is very delicate, made with thin chain and just a few beads, but it makes a big statement. Essentially, to make a hand chain you will simply create a coordinating bracelet and ring with chain, then add a beaded connector between the two. It's a brilliant design and you can use your creativity to adapt it to any bead or occasion. If you'd like to change up your Pandora bracelet or have similar charms and large beads you'd like to show off, this project is a fun option. It uses the traditional macrame knots with your favorite cord and it's easy to make. What makes this bracelet special is the fact that you can switch out the beads. Every aspect is designed to make that possible, so it can have a new look whenever you like. Did that cuff look like a little too much right now? Try a simpler peyote stitch project with this adorable seed bead ring. The ring is pretty wide at 5/8 inch, so it's sure to grab some attention. That's amplified by the use of metallic beads for an industrial look, though the heart design softens it just enough. You should be able to complete it in one beading session. Earrings are fun beading projects because they are small and simple. This allows you to play around with beads and wires to create your own custom designs. This particular design is fun and hip and combines a simple base with a fantastic chain fringe. The actual beadwork is a brick stitch that is decreased as it's worked. They look fabulous in silver but feel free to play with other colors as well. Looking for a truly unique beading pattern? Give this vintage pendant a try. It was inspired by the work of Miriam Haskell who created fantastic beaded jewelry in the early 20th-century. To create the pendant, you will stitch beads onto the face of a mesh disc. It's a freeform project, so it relies on your imagination. You'll find it to be a fabulous way to use those miscellaneous bobbles and beads that are so hard to resist at the store.